Price: 800 MSP ($10) – Buy Now!!! Although the Sega Dreamcast has been discontinued and left behind in the video game wars, that doesn’t mean that it doesn’t have its die hard fans. Though many of these people are reduced to simply dusting off their Dreamcast when they feel the need to play their favorite games from that era. Well Sega is now offering an alternative because they have brought Crazy Taxi, one of the most popular Dreamcast games, to the XBLA. But what changes have they made? Is it still the same game that fans loved or has too much been changed to remove the nostalgia factor? 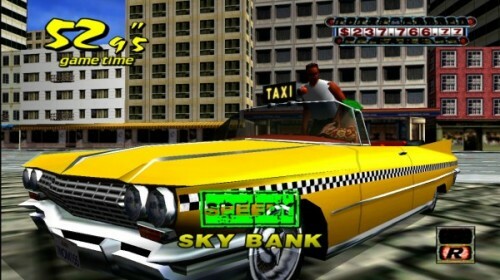 When Crazy Taxi first was seen by the public it was in arcades across the world in 1999, and then it reached its home on the Dreamcast a year later in 2000. Fans never truly cared about the graphics other than that they were more than suitable to the fast paced action game, but it has been over a decade now since then. Crazily enough (pun intended) Sega has seen fit to apply a nice HD coat of paint to the taxi and then some as they have redone the graphics to look great on HD screens. Not only that but they changed the whole display system and overall visual to fit well with today’s widescreen televisions. That means you won’t have to be worrying about sidebars full of nothing like other remade games of the past. Besides that however they have not changed much graphically in Crazy Taxi besides remove certain aspects of the game which I will address later. The graphics themselves appear exactly as fans remember them and work perfectly with the game. Keep in mind that this means that these graphics are ten years old as you begin your download and you will know what to expect. 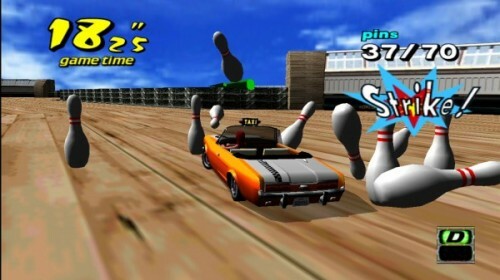 This is far from a detriment however as the appearance of the game will certainly pull on the nostalgia strings of any fan of Crazy Taxi for the Dreamcast and any newcomers to the series will see a fluid game that has no graphical errors. Though one thing still humorous today is seeing the cardboard-like fish swimming underwater without moving any part of their body. One thing that fans will notice however is that many of the locations that players will be asked to deliver their riders to have changed. Instead of taking your passengers to KFC, they will ask to go to the FCS. Yep they changed all of the signature names of the real life stores and locations. Instead of the Levi’s Store it will be a clothing store, or Pizza Shack instead of Pizza Hut. While this change may have simply been the fact that Sega couldn’t acquire the rights to place these locations back inside the game, or they chose not to, it makes the game feel far from what it used to back in the Dreamcast days. Sure in-game advertising can be something to complain about when it is overly used and not implemented well enough, but when you are asked as a taxi driver to go to Pizza Hut it gives you a more realistic appeal (barring the fact you drove underwater to get there). Instead now fans of the series are treated to un-named or name changed areas. Sure new comers won’t notice this fact and enjoy the game well enough with these places missing, but fans will be at a loss. While graphically the changes are subtle and the name changes won’t bother too many people, fans will instantly notice something is amiss when they start the game. This is because Crazy Taxi is easily associated with a certain song from The Offspring and unfortunately that song is missing. “All I Want” by The Offspring could easily be recognized as the theme song for the game with it’s signature “Yeah, yeah, yeah, yeah, yeah! opening lyrics. That is gone. The game’s entire original soundtrack is missing, which means there will be none of the favorite tunes we used to listen to as we tore through the streets crazily. Instead of Bad Religion or The Offspring we are treated to a soundtrack made up entirely of different bands that provide a variety of different background songs. Sure these songs may be suitable for those who have never played the game before but unfortunately fans will also be disappointed. Also rather than using the character’s voiceclips from the Dreamcast version of the game which featured humorous exclamations from your passengers, it has now been changed to something similar to the PS2 port. This means that you will be hearing badly voiced remarks about your driving and your speed that sound barely anything similar. One thing that can be noted though is that players can still use their own songs to play inside of the game, which means you can still listen to The Offspring while driving around, but you have to go a completely round about way to do so. Thankfully the overall gameplay remains true to the feel. There is absolutely zero depth to the game itself as it is an arcade game. You drive from one place to another to get your passengers to their destination and anyone who gets in your way better have a crazy insurance policy. Your score and ranking is determined through your overall money amount, not your amount of passengers and the symbols above potential customer’s heads can show how much money you can make off of them. There are three modes of gameplay available with this version of the game, featuring the Arcade mode, Original mode, and Crazy Box. The Arcade and Original modes are the same exact thing, but provide two different venues of large scale for your taxi driving to take place. You also have the option to choose an Arcade time limit, or a 3, 5, or 10 minute limit giving you an easy chance to reach that coveted S license. Crazy Box on the other hand is a set of challenges that the player can tackle and if they accomplish them, unlock even more special challenges. 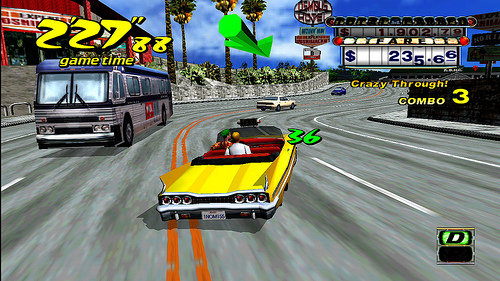 Crazy Taxi handles extremely well as you tear through the streets. 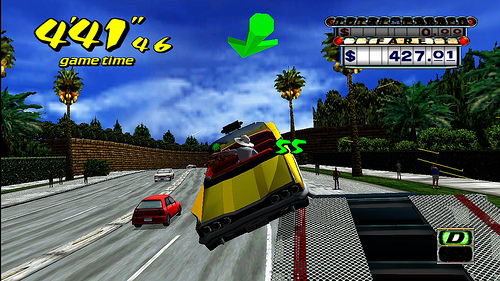 The game has a drive shift to place yourself in drive or in reverse with a press of A or B and you can even honk your horn with a push of the Y button, but then again people would have to be crazy to not get out of your way. The physics are as crazy as ever as your car can perform crazy drifts and crazy throughs to get extra money towards your cab fare. Large cars are nothing as they can be flipped over if hit hard enough and you can completely submerse yourself underwater for a submarine taxi ride. 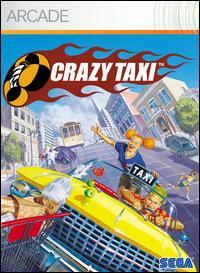 As far as the game goes it is a true to life remake of an original classic from the Dreamcast and anyone entering in for the first time will find Crazy Taxi a crazy ride. On the other hand the amount of changes that have occurred to the game’s environment and soundtrack will put off old time fans as they drive around and find their recognizable venues instead replaced with generic names and background music. Beyond these changes though they will find that their experience in playing is as true to the original as possible and can easily be either a quick play when you find the time or hours of enjoyment trying to reach the highest rank in Arcade rules.